Palm Beach, Fla. — President Donald Trump said Thursday night that he ordered a targeted Tomahawk missile strikes on a Syrian airbase as he called on "all civilized nations to join us in seeking to end the slaughter and bloodshed" in that country. Trump spoke to reporters at his Mar-a-Lago club, where he is hosting China President Xi Jinping, shortly after the U.S. missile launch in response to the Syrian regime's deadly chemical weapons attack earlier this week that killed dozens of innocent civilians. 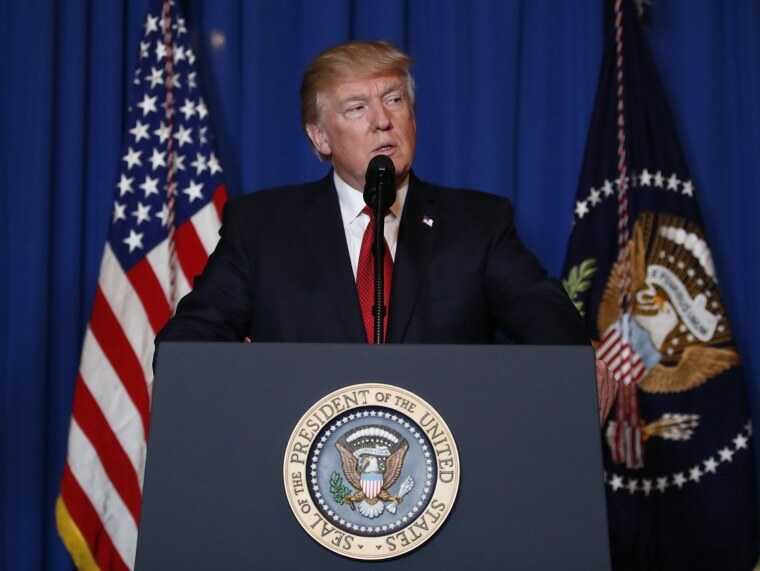 "Tonight, I call on all civilized nations to join us in seeking to end the slaughter and bloodshed in Syria and also to end terrorism of all kinds and all types," the president said. "We ask for God’s wisdom as we face the challenge of our very troubled world. We pray for the lives of the wounded and for the souls of those who passed. And we hope as long as America stands for justice and peace and harmony (it) will in the end prevail." In graphic terms, Trump put the blame for the deadly chemical attack on Tuesday squarely on Syrian President Bashar al-Assad. NBC News learned that two U.S. warships fired 59 Tomahawk missiles into the Shayrat Airfield near the Syrian city of Homs. That is the airfield Assad is believed to have used to undertake the attack that killed so many innocent civilians. Secretary of State Rex Tillerson told reporters on Thursday night after the missile strike that the U.S. assault was “proportional” and he said U.S. allies were “overwhelmingly supportive” of Trump’s decision to act. Tillerson also said the administration had a “high level of confidence” that the Assad regime had carried out the chemical weapons attack earlier this week, and that the U.S. believes the deadly nerve gas used against civilians was Sarin. Despite previous agreements, Tillerson said, Syria has not given up its chemical weapons stockpile. “Clearly, Russia has failed in its responsibility to deliver on that commitment” to supervise the surrender of those chemical weapons, the secretary of state said. “Either Russia has been complicit or simply incompetent in its ability to deliver,” Tillerson continued. Both Tillerson and National Security Adviser H.R. McMaster told reporters that the United States did not notify Moscow, which is supporting Assad, prior to the strikes, but adhered to the current arrangement in place with the Russians to keep open communication in place — called "deconfliction" — so that there are no accidental incidents between American and Russian military forces in Syria. Trump's action does not change U.S. “policy or posture on Syria in any way," Tillerson said, urging reporters not to see a change in policy based on Thursday night's strike.